The meets secretary would hereby like members to note that it is possible to arrange for meets in remote places to coincide with good weather (cf. Rum Bunkhouse, June 2017). However, she can’t pre-arrange a mass midge exodus. What do you think she is, a magician?! Kate and Claire started the weekend early with an overnight stay at the Torridon SYHA and two Corbetts on the south side of the glen – Sgurr Dubh and Sgorr nan Lochan Uaine – and finding ptarmigans and lots of lochans en route. Philip amused himself on Beinn Dearg that day; Marcus portaged Kenny’s carrier bag up the road, and stopped off at Rogie Falls for a look-see on the way to Mol Mor. Tim scooped Chris R up in Garve and the others arrived in various dribs and drabs. I failed to convince a single convicted Corbett- or Munro bagger to join me on my planned stroll [epic]. Setting off early on Saturday I did a traverse of Beinn Eighe (all of it, including the pinnacle scramble and 2x Munro summits) from Kinlochewe, followed by Beinn Dearg. A bit of time-wasting (bilberry-eating) and an aborted attempt to get back down to the glen south of the summit set me back quite a bit and I canned the idea of going up Beinn Alligin to complete the trio but had an excellent day nonetheless. As planned, I bumped into Tim as I was descending; he was on a mission to bag as many Corbetts as possible, having now passed the half way mark. He had started with Sgurr Dubh/Sgorr nan Lochan Uaine in the morning and transferred across the glen for the ascent (from sea level) of the second biggest non-Munro there is. With the fine weather it was inevitable that a jaunt up the “Hoary Place” – Liathach – would be on the cards, and a mass assault on Liathach was successfully completed with an east-west traverse by Emma, Marcus, Bex, Ali and Chris R. Despite a few butterflies of apprehension and some pretty airy sections everyone was thrilled with themselves. By the time I had returned to Mol Mor there was only one person sober enough to offer me a lift back up the glen to collect my wee car! Kate and Philip had such a colossal day in the Flowerdale forest that Philip stated afterwards “I’m never walking with that woman again!”. 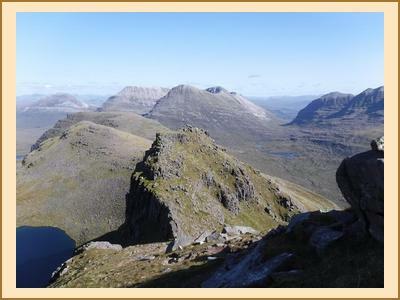 They clambered up Beinn an Eoin followed by Baosbheinn and enjoyed views directly into the northern corries of Beinn Eighe. It all started to fall apart on the way down as the non-existent path got rougher, and rougher… and a 4km surge through incredibly inhospitable tussocky/boggy/heathy terrain resulted in some choice phrases and, I’m told, some synchronised tumbles! They were last back at the digs and spoke not a word until they’d got some dinner down themselves! Kenny caught the train to Achnashellach, camping up high near Fuar Tholl in hope of a sunset to no avail. After a chilly night on Friday he walked over Sgorr Ruadh and a suspected Marilyn on Saturday, joining the fray in time for a few rounds of the board game Articulate. In the style of “Mornington Crescent” the rules morphed as the game went on, and there were some memorable moments whilst trying to act out “flounder” or one of the planets of the solar system. Expecting poor weather on Sunday I don’t think I would be far wrong by saying a few people were actually disappointed the weather had turned out well: this means we have to go out and do something! Kenny, Kate, Marcus and I headed for the wee Corbett Meall a’Ghiuthais from the beautifully kept Beinn Eighe nature trails, encountering near-gales on the summit. Quite a change from yesterday’s bluebird. Tim and Chris R were nearby on the steeper Corbett of Ruadh Stac-Beag which nestles in the lea of Beinn Eighe itself, and texted us to tell us they could see us at the top! (Chris – a good little ornithologist – was presumably carrying his binoculars!). 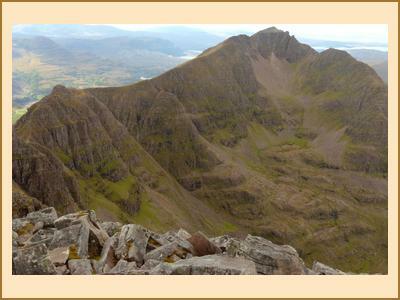 Philip did the weekend’s most popular two Corbetts. Meanwhile club president Alan R put us all to shame, running the Trantor’s round in Glen Nevis in a very respectable 16 hours. Just a short one, then!